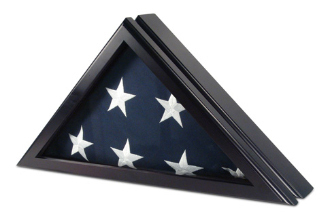 The Flag Display Case is a very impressive solid wood flag case at a great price. The Flag Display Case is a very impressive solid wood flag case at a great price. This beautiful case is one of the best selling cases. Nd is available in your choice of Cherry or Oak finish. This flag case is designed to hold a 5ft x 9.5ft flag. Features: Beveled glass front. High quality crafted hinged lid for easy flag insertion. Magnetic closure lid * Wall mount included. This case is designed to hold a 5ft x 9.5ft flag. Available in cherry or oak finish. Dimensions: 25 1/8"(W) x 12 1/2"(H) x 4 3/8"(D.